A great “book of ideas” can change the way an entire culture views itself. A lousy one catches fire, burns out, then hangs around forever like an ill-conceived piece of public art circa 1974. Either way, such books are required to run the gauntlet of doubters who insist they are little more than Trivial Pursuit cards in hardcover, deep research in service of the easy summary and spitback which somehow still require lengthy explanations at expensive conferences and corporate retreats. In Where Good Ideas Come From: A Natural History of Innovation, Steven Johnson has skated along a careful middle, skewing a commonly held assertion with reams of evidence but giving the reader room to kick the baseboard. His arguments let in air on purpose, which keeps them from seeming too yoked to a particular cultural or political moment. 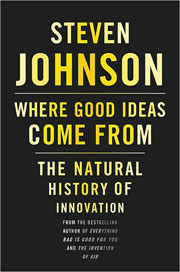 And although Johnson says this book turns more towards “his most argumentative book” (the 2005 study of pop culture, Everything Bad is Good For You) than his previous two (historical biographies of an inventor and a public health scare), he is not asking you to see it his way, but another way. Johnson’s premise is that innovation is rarely the product of a genius with an epiphany but rather of ecological factors that help an idea take root and flower. The body of his effort explores these seven factors: “The Adjacent Possible”, “Liquid Networks,” “The Slow Hunch,” “Serendipity” “Error” “Exaptation” and “Platforms.” Ideas, like evolutionary movement or balls of rubber cement, grow thanks to random, messy collisions with other half-formed notes and circumstances and arenas that allow for these traffic accidents to happen. They do not fall from the apple tree or into the bathtub, but you must have a bathtub for the inventor to think in, time to guess what the rising bathwater means and be wrong, and the foreknowledge and space to see a falling apple as more than just a falling apple. 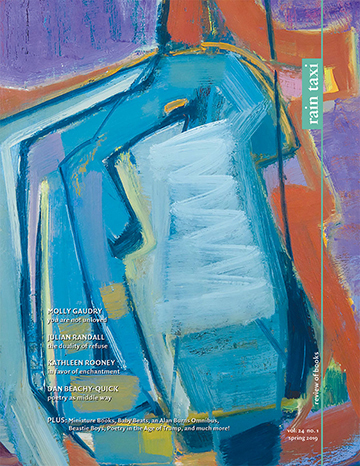 Johnson’s concept is not doubt catnip to a certain kind of reader (ye of the coastal, shake-my-foundations variety). But Where Good Ideas Come From would little more than a fashion show for a fashionable premise (albeit one backed up by deep digs into biology, history, and social research) without the essential opening and closing chapters. “The Long Zoom” idea lives in the opening and emphasizes the “Natural” in Johnson’s subtitle. Innovation, he’s saying, isn’t my pet project, but the next best version of itself to which everything gravitates. The book ends with an odd hybrid of statistical research and academic confession, a concluding chapter that feels a bit too much like an appendix. Here, Johnson graphs the milestone inventions of the last 600 years to determine how many came about via an individual or a group and how many were driven by commercial interests or not. Predictably, he concludes that as we approach the modern networked era, innovation seems to be increasingly diffuse and non-self-interested in nature, a conclusion that supports his premise without adding much to it, an effort than seems both redundant and a little defensive. The placement is crucial. Johnson doesn’t begin Good Ideas with how he approached the topic (which always seems a bit like apologizing to the reader for a sin not yet committed) but by ending it that way, he invites the reader both to reread and poke at his premise. Thus, he positions the author not as an appointed genius but as an actor in an environment of innovation. One may argue whether Johnson’s sort of achievements match the immovable permanence of a generation-defining novelist or an unmatched presidential biography. But books, like ideas, are meant to be participants in a multi-sided conversation—they are meant to be circulated, tossed about, hated, loved, and learned from, not simply judged and medaled like Olympic athletes. They should knock around the liquid network not stand silently like oracles within it. Where Good Ideas Come From does just this.